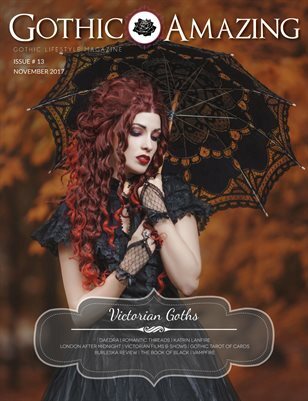 G&A issue #13 Victorian Goths Find inside interviews with Polish model & photographer Daedra and fantasy gown designer Romantic Threads. Also, 6 must-see contemporary Films & TV Series for the Victorian Goth, a review of the Gothic Tarot of Vampires and the rekindled VampFire. Don’t miss the throwback to the music of London After Midnight, the biography of Vlad the Impaler, a preview of The Book of Black, a Burleska review and an article about Victorian Goths by the Minimalist Goth. Editorials by Katrin Lanfire and Beatriz Vaz.